It’s time to Jump into Ireland! That’s the catch line this year in the marketing strategy of Tourism Ireland, the agency that promotes travel and tours to the Emerald Isle, both the Republic of Ireland and Northern Ireland. The flight time from Boston to Dublin is “almost the same as from New York to Los Angeles,” according to the agency. In fact, with a strong tailwind across the Atlantic, the flight time is a little more than five hours, and this year, with a new Delta Airline daily flight, and added Aer Lingus planes from Logan, there are more seats than ever before, and the increased competition affords some real airfare bargains this summer. 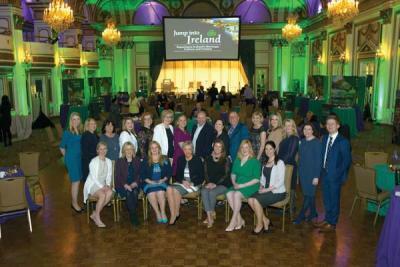 “Jump into Ireland” was the theme of an evening of entertainment and marketing efforts presented recently by Tourism Ireland to some 150 members of Boston’s travel trade and local media. The guests at the Fairmont Copley Plaza learned details about such attractions as the “Wild Atlantic Way”, the Causeway Coastal Route, Belfast’s Titanic heritage, Waterford Crystal’s new visitor center, and featured details about “Ireland’s Ancient East,” highlighting the cities of Cork and Dublin. The delegation of 12 Irish tourism companies had met with travel professionals based in Texas and Chicago before making their final stop in Boston. According to Tourism Ireland staff, the presentation featured a 60-minute “TV show format” sales pitch, highlighting the island of Ireland, and networking sessions with travel and lifestyle journalists, providing a platform to showcase and sell Ireland to travel decision-makers in each city. Attendees were treated to servings of gourmet Irish food dishes, including a lamb stew, baked salmon, Irish potatoes, and an assortment of Irish cheeses and desserts. “We are delighted to be here in Boston profiling everything that is great about a trip to Ireland, Metcalfe said. “In 2016, we welcomed a record 1.4 million US visitors. Looking to the year ahead, we are confident that our strategy, combined with more airline seats, a strong dollar, as well as the strength and competitiveness of the vacation experience around the island of Ireland, will deliver further growth. Exhibitors each had a station where they met and mingled with guests, giving details about their properties and handing out an array of pamphlets and brochures. Afterwards, a 60-minute theatrical show featured live Irish music and spokespeople from each of the Irish trade visitors from a dozen hotels, guest houses, tour operators and and tourist attractions. Among the Irish businesses making their pitch to the audience were: Authentic Ireland, Brendan Vacations, Globus Family of Brands, Adams and Butler travel, B&B Ireland, Lynott Tours, Sceptre Tours, Specialized Travel Services, Ballynahinch Castle, Culture & Heritage Tours Ireland, Extreme Ireland (EI) Travel, Epic- The Irish Emigration Museum, Glasnevin Cemetery Museum, Monart Hotel & Spa, Inchydoney Island Lodge & Spa, Lough Eske Castle Hotel & Spa, Manor House Hotels & Irish Country Hotels, and The Merrion Hotel. For more details about summer attractions in Ireland, visit online tinyurl.com/lrst2yj.